My family doesn’t eat a lot of boxed cereal. It’s not because we don’t love it. Actually it’s just the opposite! Every morning we have cereal, they eat two bowls…and my husband loves it!! Therein lies the problem. He’s diabetic and carb laden milk on top of processed carbohydrate cereal is a sugar bomb. So in order to not tempt him, we keep it out of our house. Plus, I feel like my kids easily make it through until lunch without snacks when we eat something with complex carbohydrates or protein. Most mornings I make something, and I try to incorporate veggies whenever I get the chance. This morning I had lots of grated zucchini and yellow squash on hand because I’m getting ready to preserve it for the winter. So I made a hearty zucchini oatmeal. 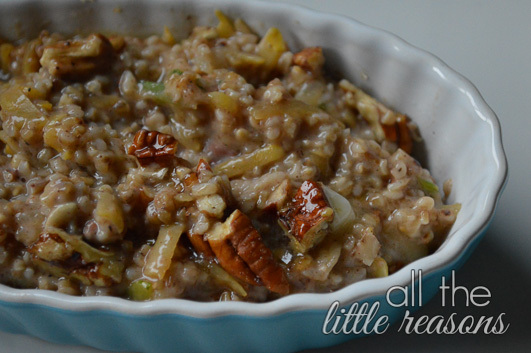 I’m sure you could make this in the crock pot, but I never love the texture of the oats after they have cooked all night. It’s a bit too mushy for me. Even though stovetop takes longer, I just prefer the nutty oatmeal with a little bit of a bite in texture. 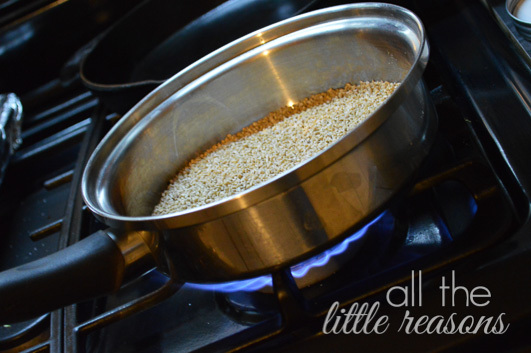 My favorite way to cook steel cut oats is to add the oats into the pan first and heat it, stirring often, until the oats get a tiny bit brown and smell nutty. If you’ve ever toasted nuts, it’s the same thing. Don’t let it go too far, because they get burned fast. I usually do a 4:1 ratio of liquids to steel cut oats. Today I used 3/4c. to measure the oats, so I added 3c. of liquid. Last time I made this I did 3 parts milk and 1 part water. Today I did 3 parts water and 1 part half and half because that’s what I had on hand. I bet this would be absolutely fantastic with almond milk. I didn’t want to make two batches and since we have a nut allergy, we stuck to real dairy. You actually don’t even need to use anything but water. I just think it takes on a creamier texture when you add milk of some sort. After I toast the oats and add the liquid, I toss in the zucchini or squash and spices and let it cook! I cooked this today for about 20 minutes. 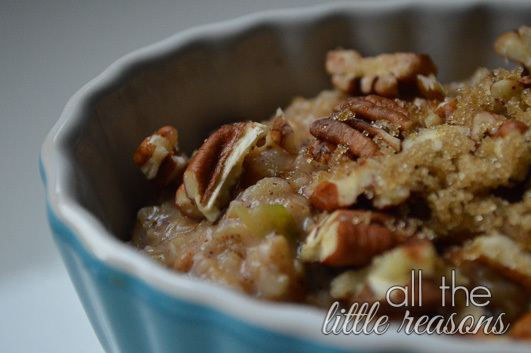 Just taste it around 20 min and see if the oats are cooked enough for you. Everyone has a different texture they like. If you’re used to quick cooking oats or oatmeal from a package, you may want to cook it a bit longer to get them softer. If you cook it longer, you may need to add a little more liquid as it cooks. Just keep an eye on it and stir often so it doesn’t burn. Top it with real maple syrup or brown sugar, a pat of butter and a sprinkle of nuts to add those brain building omegas. 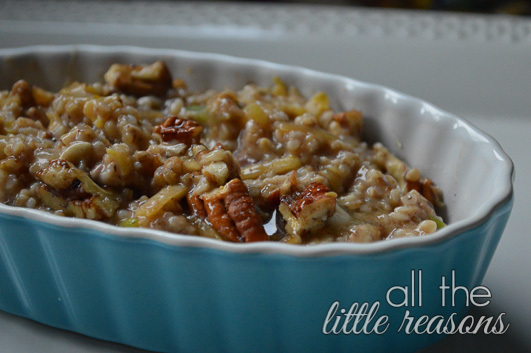 I’d love to hear how your family likes this hearty summer oatmeal! 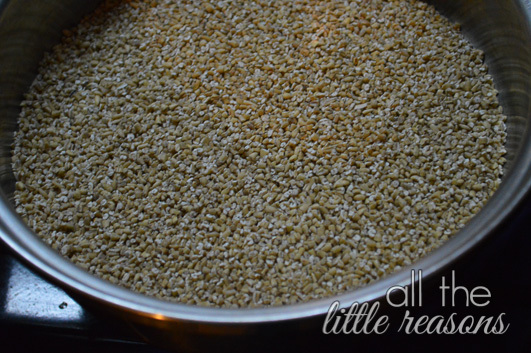 Toast oats in dry pan until they smell nutty, stirring often. Cook, stirring often, until oats are soft (20-30 min). 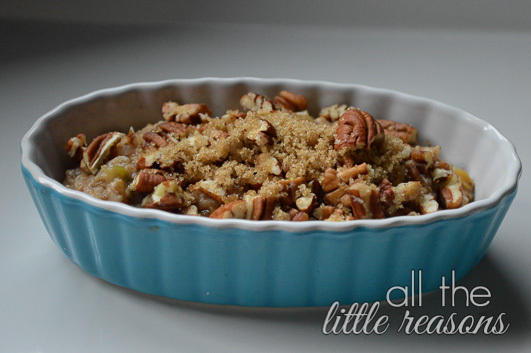 Top with real maple syrup or brown sugar, pecans and a pat of butter.